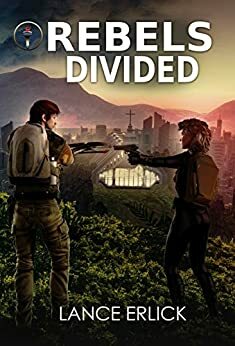 Written as a standalone dystopian action story, Rebels Divided is also part of the Rebels series, three years later. The first time Geo (19) sees Annabelle (19), they meet as enemies and she doesn’t kill him. Coming from enemy camps, Geo and Annabelle must come together to rescue her sister and gain justice for his pa’s murder. Complicating this, the Federal governor and Outland warlord conclude a secret deal, pledging Annabelle in marriage to the warlord and putting a bounty on Geo. While trying to survive and achieve their goals, the pair must struggle with growing feelings for each other despite being sworn enemies. Lance Erlick writes science fiction, dystopian and young adult stories and likes to explore the future implications of social and technological trends. He is the author of The Rebel Within, The Rebel Trap, and Rebels Divided, three books in the Rebel series. In those stories, he flips traditional exploitation to explore the effects of a world that discriminates against males and the consequences of following conscience for those coming of age. He is also the author of two unrelated short stories: Maiden Voyage and Watching You. To learn more about the author and his stories visit his website at http://www.LanceErlick.com.